You might have already encountered dating sites that claim to be completely free. They let you become a member, fill out a lengthy questionnaire, upload some pictures and create a nice profile…. Then when the time arises and you want to communicate with a cute member you’ve found – Boom! – you are suddenly prompted with a box that tells you that you need to upgrade your membership to continue. Keep in mind that nearly all dating services offer some kind of free basic membership or free trial such as this, just to hook members in and to entice them to have a look around the site. But which sites are genuinely free, and what do they offer? When talking about free dating many people quote the saying that “you get what you pay for”. Any service that’s totally free of charge just can’t be very good. Or can it? Are free dating sites lower quality than pay sites? The main difference between free and pay sites is that the free ones are usually paid for by advertisers or sponsors instead of the members themselves. If you don’t mind the occasional advert appearing, this shouldn’t present too much of a problem. 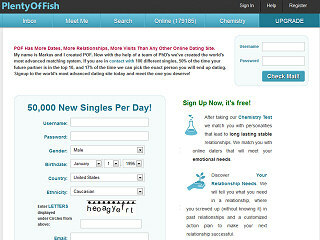 Plenty of Fish (POF.com) for example regularly appears in the list of top ten visited matchmaking sites worldwide, along with leading pay sites such as eHarmony.com and Match.com. Since there’s no financial commitment and little effort required in signing up, the issue is whether those who use such sites are serious about a relationship, or if they just want to test the waters of online dating. In other words, are free dating sites full of time-wasters? Well looking at sites like POF and OkCupid it would seem not. With thousands of success stories and marriages attributed to the sites, it seems that many people using free services really are there to find love and succeed in doing so. The other concern people often have is about safety and security. Without credit cards or other payment methods to check, there’s no built in way to verify the personal identity of members. And with most free sites being run on a tight budget, it can be the case that there’s less effort devoted to moderating profiles that appear or the behavior of members, including online help and support. In either case, as with any online dating experience, members ultimately need to act in a responsible way that does not expose them to risks of unsavory characters that could lurk in any online communities. Following common sense safety guidelines is a must, ensuring that personal information is kept safe. Here’s a run down of some of the best free sites and what they have to offer. Plenty of Fish was founded by computer programmer Markus Frind in 2003, and is now the largest and most successful free online dating site in existence. While other sites earn their proceeds from charging their members to use certain features, Plentyoffish relies heavily on advertising revenue to support itself. Up until recently, its founder was running the site single handedly from his apartment in Vancouver, but due to the massive growth of the site, he has since hired some helpers. The site offers things such as email and compatibility testing at no charge. This can be a good option for those who want an online dating site with decent features but find themselves on a budget at the same time. Plentyoffish does have an optional payment called “serious intent”, which does grant a few extra privileges. It also indicates a member is genuinely seeking a partner. This was introduced to tackle the major problem of separating those members who are there for genuine reasons, from scammers, time wasters and the cheats who are there to take advantage of a free service. Plentyoffish is a very large community and though it largely caters to North America and the UK, one will find numerous members from around the world. To help make finding a compatible match easier, the site offers the chance to take a chemistry test. This feature uses carefully placed algorithms to analyze certain personality traits and characteristics. Upon completion, the results are then matched to members with balancing qualities. Once a week, compatible matches are sent to a member’s onsite email account where he or she can then decide whether or not to make contact. 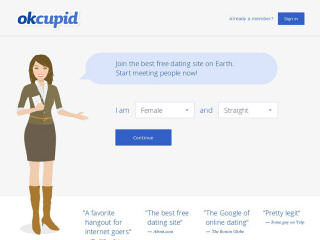 OK Cupid is site popular with the younger crowd – it has members from across the world and offers a great selection of advanced features. On joining the site, you are taken one step at a time through a series of easy to follow pages. Just choose a screen name, provide a password and click on each question that is asked. Once you enter, there are several methods available to you to let you find people who share your interests or who may be romantically compatible. To improve your matches, you can also participate in an online personality questionnaire which takes about 5-minutes to complete properly. The questionnaire asks you twenty-five questions about yourself, your personal values, and your ideal partner. A number of unique matchmaking features are available to use. You can compare your profile to any other member you interested in and see how you “would fit together” on certain points of your profile or personality. The quick match tool lets you search for people by distance, gender, desired relationship and other criteria. OKCupid is fun to use and has a number of quirky things to spend your time on, such as the Wiki tool which enables you to specify friends or relations who are allowed to alter your profile. You can moderate any changes or additions to your profile before they appear. There’s also a blog forum where you can write about your daily activity. If adverts really bother you, you can upgrade your membership to remove them. JustSayHi was “re-launched” as Mingle2.com. This plain and simple website has plenty to offer those seeking a totally free dating experience. While the number of profiles on the site is not huge, most people living in or near larger cities should be able to find others to date or hang-out with. To join, there’s a 60 second sign-up. Simply provide an email address and complete the details on the first page. You need a valid email address to activate your account and to be able to receive emails. Following this, you can enter further information about yourself on the next page, including your interests, marital status, and physical appearance. Finally just choose a username and password and you’re ready to go. Additional details and photos can be added to your profile at any time. Locating people to meet in your area is a snip with the quick search tool. There’s also a more advanced search that allows you to refine your match to suite your tastes. As an alternative, the MutualMatch option presents photos of other members, one at a time, and you can choose yes, no or maybe. You need to have your own photo uploaded to use this feature. Each profile has interest tags listed at the bottom, and you can click these links to discover other members with similar interests and hobbies. Mingle2 also has a community forum where you can chat with other members. Members: Hundreds of thousands, mostly U.S. Although MatchDoctor does not have an enormous number of members, those living in large cities in United States, Canada and the United Kingdom, or those prepared to travel shouldn’t have any difficulties finding partners on this site. Signup requires a little patience as there are several pages of detailed questions to complete. The first page asks for a login name, a valid email address, your age and your city, while the following pages ask more specific details regarding your appearance, marital status, your education and ethnic background. You can also enter a headline and mini-biography describing yourself for other members to see, as well as adding a few lines saying what you are looking for in your preferred partner. Once you’ve completed this, you are ready to begin exploring the site. Once you enter, as well as the possibility of finding love and romance, you’ll also find forums, blogs, event calendars, videos, quizzes and many other ways of participating in this friendly online community. The matchmaking tool allows you to identify people you are interested in, and allows you to set various search criteria such as appearance, education, profession, income and type of relationship. Unfortunately there’s no quick search, although you can choose to ignore many of these options if you wish. Distance searching is only available for the UK, US and Canada. This free contact site is for heterosexual adults. BoM primarily represents singles in the United States, but they also have members from England, Canada and Australia, as well as other parts of the world. BoM has been in business since 2003 and does have an adequate amount of male and female singles from every state. The total active members is currently around 24,000. You can begin a search on Bookofmatches.com without signing up. You will get a brief listing of singles available in the city and state you choose. The site claims it only takes 30 seconds to make your very own profile – which I can confirm. After you have a profile made, your search will return more responses that are detailed. Each profile has the ability to select drop down options describing them, add a picture and explain what they are looking for in detail in their own words. BoM intends to be a starting point for singles to meet and chat in real time, and get real results. « Sugar Daddy Sites : Who Says Money Can’t Buy Love?